Background: Christmas, which means “Christ’s Mass”, is a yearly celebration of the birth of Jesus Christ, Our Messiah and Saviour, to the Blessed Virgin Mary and her husband Joseph. 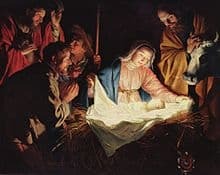 His birth was in very humble surroundings, a stable in Bethlehem. Christmas Day is 25th December. Divine Infant, after the wonders of Your birth in Bethlehem, You wished to extend Your infinite mercy to the whole world. You called the Wise Men, by heavenly inspiration, to Your crib which was a royal throne. You graciously received those holy men who were obedient to the Divine call and who hastened to Your feet. They recognized and worshiped You as Prince of Peace, the Redeemer of mankind, and the very Son of God. Show us also Your goodness and almighty power. Enlighten our minds, strengthen our wills, and inflame our hearts to know You, to serve You, and to love You in this life, that we may find our joy in You eternally in the life to come. (Share your request…) but, may God’s will be done. Divine Child, through Your most Holy Mother’s most powerful intercession and through the boundless mercy of Your omnipotence as God, I beseech You for a favourable answer to my prayer during this Novena. Grant me the grace of possessing You eternally with Mary and Joseph and of adoring You with Your holy angels and saints.